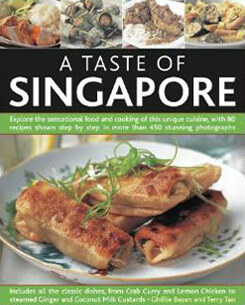 This book features a collection of over 80 popular recipes from Singapore. All the classics are included, from Singapore Laksa, Samosas and Crab Curry to more unusual specialities such as Oyster Omelette, Pandan-wrapped Chicken and Rojak. This title lets you explore the sensational food and cooking of the region, with over 80 authentic recipes shown step-by-step in over 300 stunning photographs. It is an inspiring collection of traditional and exotic recipes that capture the essence of the cuisine. It features a concise introduction about life in Singapore, with information about the region, geography, history and culinary traditions. Each delicious recipe is accompanied by a beautiful picture of the finished dish, as well as step-by-step instructions, so that perfect results are achieved every time. Complete nutritional information is provided for every recipe to help you plan a healthy and balanced menu, plus cook’s tips and variations to encourage experimentation. This book features a collection of over 80 popular recipes from Singapore. All the classics are included, from Singapore Laksa, Samosas and Crab Curry to more unusual specialities such as Oyster Omelette, Pandan-wrapped Chicken and Rojak. There are also some wonderful sweet snacks to try too, including Jellied Mango Puddings. More than 300 colour photographs illustrate how each dish is made, as well as showing the beautiful final result. Full nutritional information provides an at-a-glance dietary reference, and there are many suggestions for variations as well as cook’s tips throughout.